The planned four-spacecraft Blagovest constellation was designed to provide military communications for the Russian Ministry of Defense. 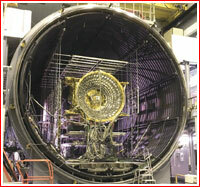 A series has been developed and manufactured at ISS Reshetnev in a Siberian city of Zheleznogorsk. Blagovest is a Russian religious term meaning "good news." 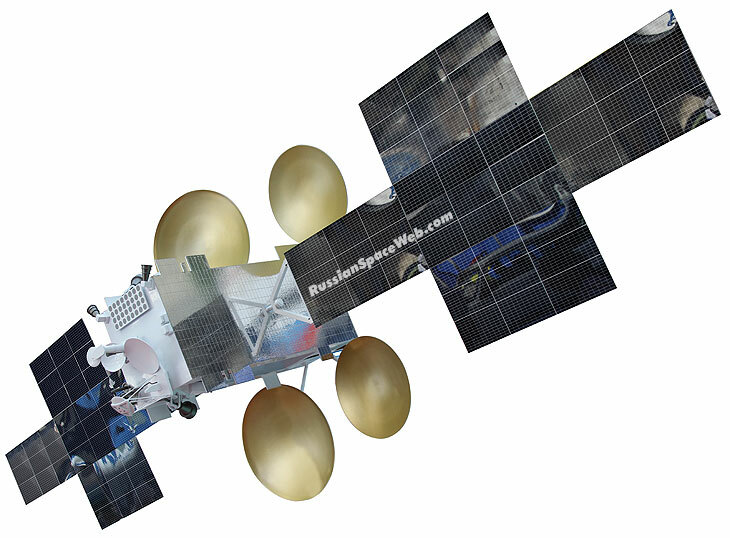 According to initial reports, the Blagovest satellite was to be equipped with a new-generation communications payload developed by ISS Reshetnev in cooperation with the European consortium Thales Alenia Space. Operating in Ka- and C-band, the transponders were designed to enable a broad-band Internet access, data transmission, broadcasting of TV and radio-programs, video-conferencing and telephone communications. Later, ISS Reshetnev said that it had developed the payload independently. According to some reports, the payload was named Svetoch, an archaic term meaning a source of light or knowledge. 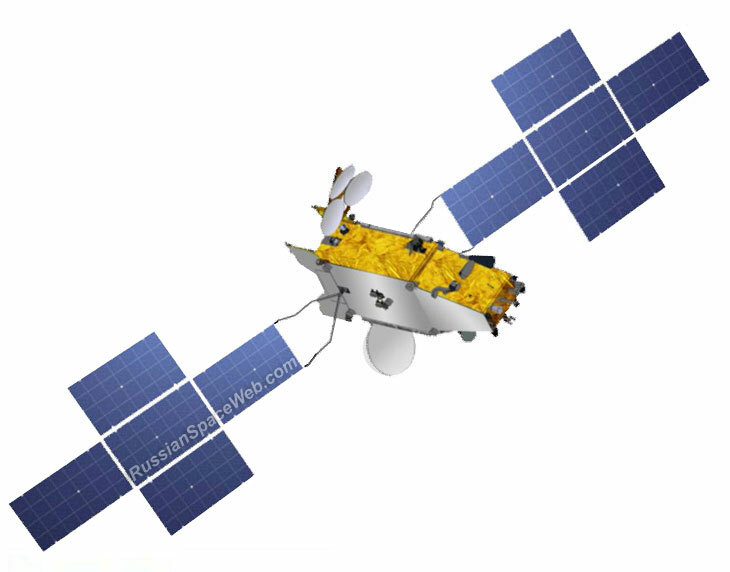 The company also said that the Blagovest had become the first Russian satellite operating in Q-band, in addition to Ka-band. Both bands enable the satellite to point narrow-angle high-energy beams at the Earth's surface for use by customers with small-size antennas. 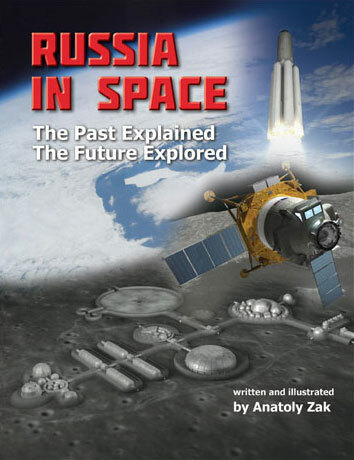 Though the satellite was owned and operated by the Russian military, it was designed to transmit via open communications channels, according to ISS Reshetnev. 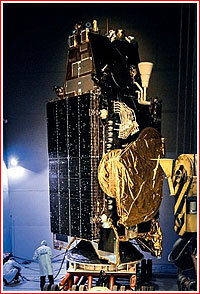 The satellite was based on the ISS Reshetnev's Ekspress-2000 platform, the company's largest standard spacecraft bus. The comparisons of Ekspress-2000 to available visuals of the Blagovest reveal a large expansion of the payload module and enlarged radiators. The Blagovest project is the brainchild of Anatoly Serduykov during his tenure as the Russian Minister of Defense from 2007 to 2012. During that period, planners at the Ministry of Defense apparently proposed to create a military controlled commercial competitor to Russia's state owned civilian satellite communications agency, GPKS, which operates the Ekspress orbital constellation. The new military-controlled satellite operator called Voentelekom was conceived to provide a wide range of communications, including multimedia and video-conferencing to military and commercial customers. The plan called for the procurement of European-built ground infrastructure for high-volume communications operating at frequencies of 20-44 gigahertz and known as Ka/Q-band. 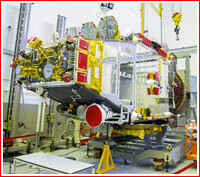 However according to posters on the online forum of the Novosti Kosmonavtiki magazine, compact and mobile ground stations operating in Ka-band to support the Blagovest project were not expected to come online until seven or even 10 years after the first launch in 2017, apparently prompting developers to partially re-purpose the project for communications in C-band providing such services as non-secure basic communications to Russian military bases across the country. Observers noted, that available photos of the satellite apparently showed only fixed antennas, which could not be re-pointed to beam signals to different regions on Earth. 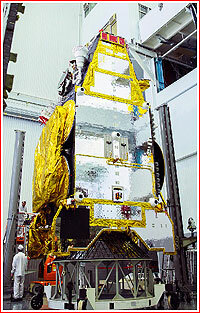 One estimate counted as many as 36 Ka-band transmitters on the Blagovest. Some observers were puzzled by the apparent excessive capacity of the network for the assumed needs of the Ministry of Defense, another hint of a dual military and civilian application of the system. Although Serdyukov lost his job as the Minister of Defense long before the first Blagovest had a chance to reach the launch pad, the project continued under the new head of the Russian military Sergei Shoygu, who was especially fond of novel medium of long-range video-conferences, observers noted. However, the Kommersant daily claimed that Shoygu had dropped the idea of providing commercial services with the Blagovest system. 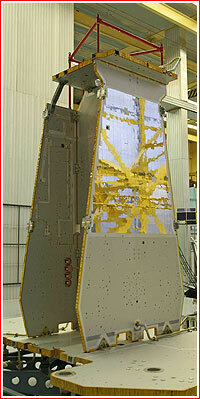 Probably due to its limited military role, the Blagovest project was partially declassified around 2015, with many images of the satellite and some other data on the system publicly released long before its launch. The first mission of the Proton rocket in 2018 successfully delivered the Blagovest-12L spacecraft for the four-bird constellation of military communications satellites deployed in the geostationary orbit 36,000 kilometers above the Earth's surface. The liftoff took place as scheduled on April 19, 2018, at 01:12 Moscow Time (06:12 p.m. EDT). 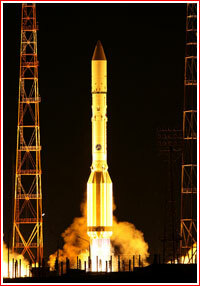 According to GKNPTs Khrunichev, it was the 417th launch of the Proton rocket. On October 1, 2016, ISS Reshetnev announced the beginning of autonomous tests of the attitude control and stabilization system, SOIS, for the third Blagovest satellite. On July 2, 2018, the head of the company Nikolai Testoedov said that the assembly of the satellite was scheduled to be completed in October 2018, so that its launch could take place from Baikonur after a 45-day campaign in December 2018. At the same time, the launch of the fourth satellite was expected to be completed in 2018 and its launch in the first quarter of 2019. 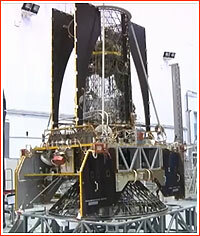 The launch of the third Blagovest was previously scheduled for November 2018 and possibility of delays as far as January 2019 were reported in July 2018.